Just how far will women go for straight hair? A new wave of life-changing chemical, straightening products is becoming a must at salons across the country. But they could be damaging your hair, and your health. Word is spreading about a salon product that promises longer-lasting results. Some U.S. women are lining up to get the Brazilian Blowout, a pricey method of hair-straightening that has been used by Jennifer Aniston, Lindsay Lohan, Reese Witherspoon and other celebrities. But recent government testing shows that the trademarked products may pose serious safety risks, which the manufacturer has flatly denied. One salon in New York is now issuing gas masks to its customers. "When I tell my friends that I get my hair straightened and I wear a gas mask they think I'm nuts but I'm still here and it works really well, it's life changing to me," said Melanie Gotlin, a hair salon client. At the Mark Garrison Salon, stylists take every precaution to keep their clients safe from the potentially harmful chemicals used in the treatment. "I am not going to take any chances I am going to be safe," said Mark Garrison. The salon uses a special room equipped with air ventilators and industrial strength gas masks. But not every salon goes to those lengths for the hair straightening trend sweeping the nation with promises of amazing before and after results. Staffers at an Oregon hair salon complained of eye irritation, nose bleeds and difficulty breathing after they applied the products, so state officials tested them. Chemists at the Oregon Occupation Heath and Safety Administration and the Oregon Health and Science University's Center for Research on Occupational and Environmental Toxicology tested a sample from the complaining salon and from other salons in the area. They found that the samples contained significant levels of formaldehyde, even though the product was labeled as formaldehyde-free. The Oregon Health and Science University issued a public health alert about the product, in which it said that two formulations of the product contained 4.85 percent to 10.6 percent formaldehyde. If a hair treatment solution contains more than 0.1 percent formaldehyde, the manufacturer is required to alert the stylist. Additional laboratory analysis also detected four additional chemicals in each sample that were not quantified in the lab, including methanol and ethanol. Everyone is exposed to small amounts of formaldehyde in air and some foods and products. The U.S. Centers for Disease Control and Prevention says low levels of exposure can cause irritation of the skin, eyes, nose and throat. High levels of exposure may cause some kinds of cancers, the CDC says. Until salon employers can confirm that hair care products contain no formaldehyde, they should stop using them or use them in accordance with the formaldehyde standards, which recommends the use of masks, goggles and even respirators, depending on the level of airborne exposure, an OSHA official told "GMA." Additional testing of air samples, however, showed acceptable levels of formaldehyde exposure in the air, but the makers of the Brazilian Blowout maintain that there is no formaldehyde in their product. In addition, the company released a statement which said, "We have initiated formal legal proceedings against Oregon OSHA for damages arising out of misconduct for manipulating test results." Despite it all, many women refuse to give up the products, calling the experience "life changing." A few days before the Oregon OSHA's findings were released, "Good Morning America" tagged along with Krystal Mansour and Ranya Douglas, two salon clients who wanted to test the Brazilian Blowout in the hopes that it could tame their wayward hair. "I would just like to be able to wake up, do my hair without a problem," Mansour, a resident of New York's Long Island, said. "I don't want to have to wait a whole half an hour, flat-ironing, pin curling, blow-drying, relaxing." At the salon, stylists applied the solution, which, according to the company's website, is made of amino acids and nutrients. The stylist promised the keratin in the products would leave hair shiny and smooth finish. After the products was applied, the stylist used a flat iron to seal the treatment. Only 30 minutes into the process, Mansour started to complain that her eyes were burning. "My eyes are pretty sensitive," she said. "It's just one of those things. I mean, the same thing when I get my hair colored." But both women were more than happy with the results. "It is bone straight," Douglas, 24, said of her hair. "It never gets this way. It never looks this polished. The edges are usually so frizzy. I can't believe my hair looks like this." Mansour considered her treatment life-changing. "Now I can show it to the world," she said. "I'm just so excited. This product is really awesome." The makers of Brazilian Blowout defended their product, saying they were conducting their own investigation. Because OSHA did not request samples directly from the company, Brazilian Blowout is questioning the results. "At Brazilian Blowout, the safety of our products, stylists and consumers is our number one priority," the company said in a statement. "We stand behind the integrity of our product, and affirm that our professional solution is indeed formaldehyde-free." Click HERE to read Brazilian Blowout's complete statement. Brazilian Blowout doesn't come cheap. Treatments can range from $200 to $500, and the results can last from 10 to 12 weeks if clients use the after-care product line, according to the company's website. Platform Artistic Salon in Oregon no longer uses the product. The product was tested in Oregon initially because of the salon's experience with it. Salon owner Pauline Steiner told the Oregonian newspaper that she and stylist Molly Scrutton, fitness enthusiasts and running partners, suffered ill effects. "After about three months of using the product, "we just realized our lungs felt impacted from doing the Blowout," Steiner told the newspaper. "We couldn't run the next day." Brazilian Blowout says their case has been turned over to OSHA in California and so far no action has been taken against them. But the salon "GMA" visited in New York City last month, NYC Dramatics, stopped using Brazilian Blowout shortly after the report and is now searching for alternatives. Stylists said that if you want to save money, try a more inexpensive shampoo and conditioner that is sulfate free, available in most drug stores. Don't be afraid to bargain with the salon. Sometimes they'll lower the price of a treatment if you just ask or let them know that another salon is offering the same treatment for a lower price. 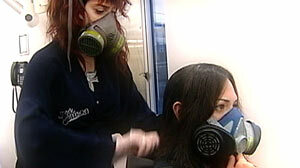 Women Fight Fumes for Beauty: Would You Wear a Gas Mask to Have Your Hair Done?